“Trust your coach,” “Trust the process,” “Trust me," are common phrases, particularly as words of encouragement to lifters encountering their first significant hurdle. As coaches, we ask our clients to have faith in us, our cues, and our programming. Trust makes the coach’s cue work because it calls for an immediate, real-time action or change to bring the lifter closer to the physical model of the lift. The lifter needs to make a choice to accept our direction and act without the delay of interpretation. Without trust, or with low trust, a lifter may doubt, resist, or even disregard instructions provided. A delayed reaction wastes precious time during the short window where a cue is effective. Longer term, trust can be the difference between keeping and losing a client. Research shows that low-trust environments reduce the rate of investment and that low-trust nodes will be eliminated from a network  . Both experience and the literature are clear: trust is critical to maintaining mutually beneficial relationships. This article will define trust, breakdown the elements of trust, and offer tools to intentionally build trust so that you can be a more effective coach. Coaches who have been training for years may forget the sense of vulnerability that a client may experience with a new coach or approach to training. 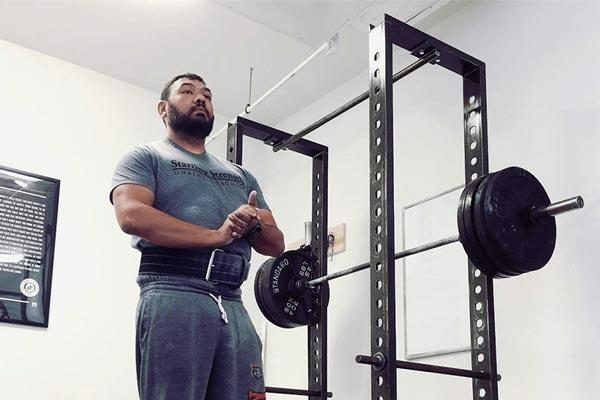 For example, a new lifter may be dealing with a fear of barbell training – conditioned by years of misinformation that these fundamental human movements are somehow bad for us – or insecurities about their bodies or the way they move. Clients may be afraid to open themselves up to critical feedback. This vulnerability to a perceived risk – conscious or unconscious – is critical to understanding how to build and maintain trust with your client. The above definition comes from a meta-analysis of research on trust in which the researchers (Mayer, et. al) developed an “Integrative Model of Organizational Trust.” Mayer and his colleagues found three Factors of Perceived Trustworthiness common in the literature – things that influence a person’s willingness to trust someone in a leadership role. These factors are perceived ability, perceived integrity, and perceived benevolence. (The model also includes a trustor’s general propensity to trust, but that is outside the scope of this article. Focusing on The Factors of Perceived Trustworthiness is more relevant because our actions are under our control.) 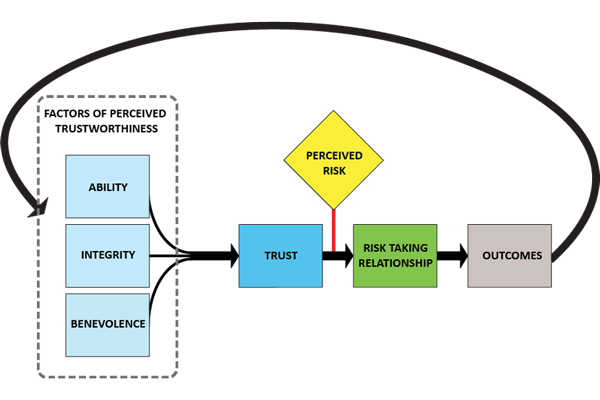 The Integrative Model of Organizational Trust (Figure 1) illustrates how the three factors influence trust. A trustor’s perception of the three variables is one of the two inputs considered in a risk-taking relationship. As shown below, the model has a feedback loop. Trust is dynamic, continually being evaluated and re-evaluated by the trustor based on the outcomes of the risk-taking relationship with the trustee. In effect, trust is evaluated based on how the trustor perceives the three factors after choosing to be vulnerable. The trustee’s actions are always building, eroding, or cashing in on trust. In other words, do the coach’s behaviors and perceived intentions dispose the trustor to be vulnerable? With a deeper understanding of these factors, we can use this model as a framework to build trust with our clients and make us better coaches. Ability is domain dependent. My perceived ability as a strength coach doesn’t translate to a perceived ability to juggle chainsaws, for example. Earned titles, credentials, personal accomplishments, and professional presence are all ways to influence another’s perception of your ability. As a coach, credentials and nominal experience may be what gets someone to call you, walk in the door, or email you for the first time, but you must also demonstrate your ability as the relationship continues. 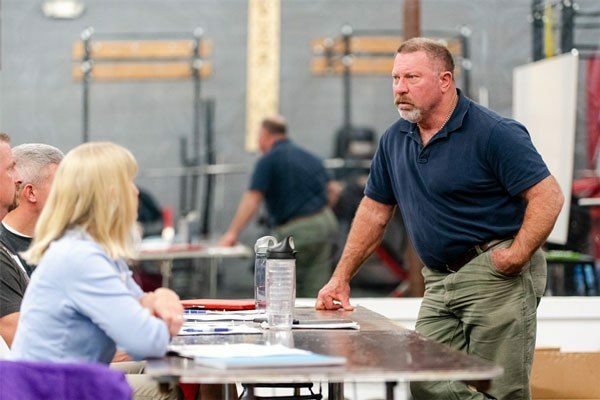 Much of a Starting Strength Coach’s perceived ability is based on the high standards maintained by the Aasgaard Company and the popular understanding that earning the credential is extremely difficult. The credential builds a large bank of perceived ability that Starting Strength Coaches benefit from. This initial bank, however, is just the starting point. After the first interaction, your perceived ability then becomes increasingly dependent on the series of interactions and outcomes that occurs during the coach-client relationship. The Starting Strength teaching model and novice linear progression are inherently trust-building activities. 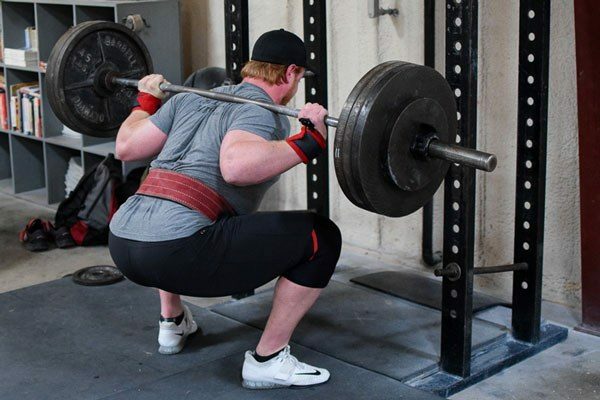 Within the first session or two with a Starting Strength Coach, clients typically learn to squat, press, and deadlift. 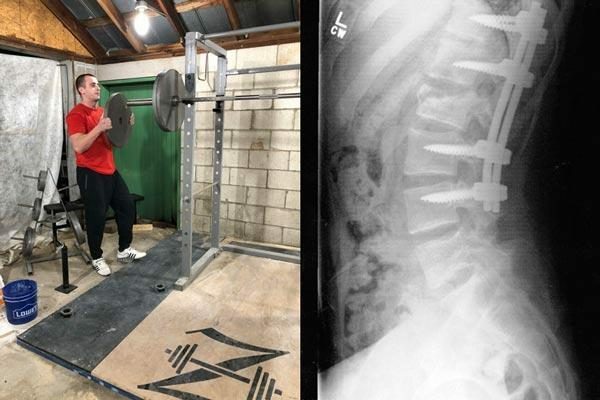 For some, it is the first time in years, if ever, that they have sat down into the bottom of a squat, let alone stood back up with weight on the bar. 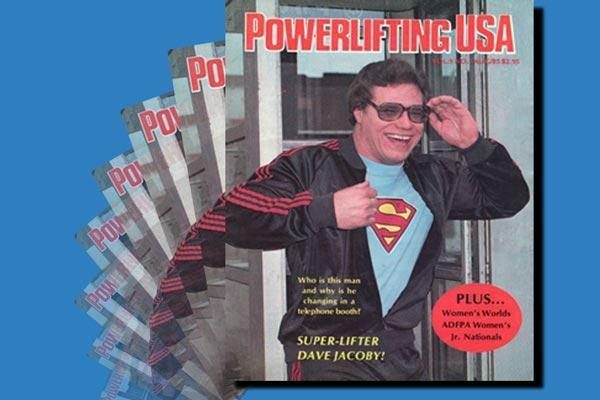 The model, including modifications an experienced coach makes to accommodate the individual lifter, works for just about everyone, every time. This initial client experience validates the perception of ability and therefore increases trust. At the end of your clients’ first sessions, they write down their initial weights and are told to come back in two days, at which point they add more weight to each lift. This process repeats, and the client experiences consistent improved outcomes in every single session for several weeks or months. Your client is demonstrably stronger than they were when they started, and a tremendous amount of trust is built based on those outcomes. But while ability is the starting point for establishing and maintaining trust, it can’t maintain trust alone. The researchers found that trustees with a high-level of perceived integrity had a track record of consistent actions, a favorable reputation from credible sources, a strong sense of justice, and actions that were consistent with their words. This factor is tied to the trustor’s expectations and the trustee’s predictability based on those expectations. The concrete actions you can control that influence your perceived integrity are a combination of consistent behavior and speech. Doing what you say you’re going to do and speaking the truth are simple and effective ways to influence how others perceive your integrity. The smallest aspects of a relationship can have profound effects on integrity over time. Showing up on time to an appointment, for example, may seem trivial until you view it as an opportunity to build or erode trust. This isn’t to say that arriving five minutes late one day will erode all trust – in a healthy, high-trust relationship it would be brushed off as a non-issue. We all know those people, however, who are chronically late to almost every appointment. That kind of expectation influences our perception of them and their ability to do what they say. Perceived integrity is also a byproduct of consistent behavior. A coach will build trust more effectively with a predictable approach to each session. This isn’t to say that change must be avoided or that you can’t evolve your methodology. Erratic or unexplained swings in day-to-day interactions, however, can leave the client unable to know what to expect. Models are useful tools for building integrity because they provide structure for consistent coaching. Again, while individual incidents can make or break trust, the model is more useful in thinking about long term patterns of behavior that incrementally influence perceptions over the course of a relationship. We use models for coaching movement because a model enables the coach to adapt to the specific while holding steady to common principles. The same is true for applying the trust model. Our words also have the potential to be our most powerful ally or worst enemy in building integrity. Pay attention to what you’re saying, and choose to speak only what you know to be true. Start paying attention to whether you feel stronger or weaker when you speak. Notice, for example, how you feel when you gossip or complain in contrast to how it feels to speak openly and honestly from your own experience. As with ability, you cannot control other people’s perceptions, but you can consciously choose to act and speak in a way that demonstrates integrity and therefore builds trust. The third factor is perceived benevolence: “The extent to which a trustee is believed to want to do good to the trustor, aside from an egocentric profit motive.” The simple version is “Do they care?” Not only are actions important but the apparent motivation of one’s actions as perceived throughout the relationship also matters. So, how do you act and speak in a way that convinces people that you care about them? First, prioritize the trustor’s goals over your own. Then, act and speak in a way that is consistent with that motivation. Don’t take advantage of the trustor for personal gain. Here’s a big one: try to listen more than you speak. While integrity is more influential early in a relationship, benevolence becomes an increasingly potent factor over longer periods of time. You may have excellent ability and high integrity, but if your behavior creates a perception that you don’t care about the trustor, trust will erode over time. This isn’t to say that you need to be “nice” toward the trustor. Many of the best coaches I’ve had were known for having gruff personalities and short tempers in addition to their exacting standards. Behind their personal style, however, I never doubted that they had my own or my team’s best interest at heart. My high school choir teacher, Mr. Pool, was a short, stout man with white hair and a handlebar moustache. He was an excellent musician and maintained the highest expectations for his choirs and the jazz band that he also led. During practices he was intense – mixing passionate explanations about the meaning of each piece of music with staccato outbursts correcting the tiniest detail. Between classes, however, Mr. Pool was known for his unwavering support of students. He genuinely cared about us and took time to listen and encourage those that needed it most. He expressed compassion for each student as a worthy person. No one would describe Mr. Pool as “nice.” In fact, it was not uncommon for tears to be shed during his practices. Not everyone cared for his personality or style, and it often rubbed people the wrong way. But the students in his class never doubted that he cared. This perceived benevolence enabled him to be a more effective coach because we trusted that his expectations came from a belief in our ability rather than a judgment of our character. Now, having described the model and defined its three driving factors, you may be left wondering how to apply this model to make yourself a better coach. The first step is to pay attention to what trust is doing with those around us. Are we building, eroding, or cashing in on trust? This model should perhaps first apply to your own self-image. When I first started paying attention, it quickly became clear that I wasn’t managing trust well. A series of questions led me to the painful conclusion that I didn’t trust myself. I often didn’t perceive that I was able to do what I said; and, therefore, I frequently didn’t do what I said I would do, eroding my own perceived integrity. I wasn’t intentional about taking care of myself. I used to think that it was possible to maintain an inner critical voice that berated most of what I did or said without affecting anyone else. I thought that I could be mercilessly critical of myself and insulate that inner world from the people around me. Framing my self-image through the lens of trust, however, forced me to confront the fact that I needed to work on building trust within myself before I could reasonably expect others to trust me. I focused on developing my ability as a coach by practicing, studying, and continuously learning. I tried choosing my words more intentionally. I was more careful about making commitments and ensuring that I could follow through. And I started to notice and reject the overly critical inner voice, replacing those unnecessary harsh words with constructive framing aimed at improving rather than tearing myself down. My suggestion is that you try the same. Perhaps pick a skill to develop or a subject you want to learn and improve incrementally over time so that you can begin to see yourself as able. To build confidence in your integrity, make a plan and follow it through. If that’s too much, pick something small that you can hold yourself accountable to do every day. Finally, prioritize taking care of yourself. With each factor, building trust becomes a practice—you develop the skill of being trustworthy by noticing your behavior, without judgment, and choosing to act differently in the future. Pay attention to how you’re influencing trust, observe the outcomes of your behavior, and adjust accordingly. Building trust is a lot of work and never feels finished, but it’s a meaningful process that can be refined over long periods of time. A powerful and practical way to build trust within yourself is through training –voluntarily choosing to put weight on a bar to squat, press, and pull and practicing getting better and lifting more weight over time to become more physically able. Sticking to a consistent training schedule and program builds a sense of integrity. Training isn’t selfish: it means you’re prioritizing health and taking care of yourself for the long run. Using the model for trust described in this article, training is a trust building activity: developing ability, sticking consistently to a plan, and prioritizing your own goals. Once we’ve turned it on ourselves, the model can then be applied to how we coach our clients. We can build on our perceived ability by building up our skills, refining our implementation of the teaching progressions, practicing the art of coaching, and gaining experience. To build integrity, our daily behavior must be reliable; speak carefully and consistently and follow up words with actions. And benevolence is built in every interaction that demonstrates that we care about our lifters, their goals, and their progress. A coach remembers the moment they started caring more about their lifters’ results than their own. One of the keys to building trust is recognizing that it is an endless cycle. Trust doesn’t vanish instantly, though you can quickly erode trust with just a few actions. The point isn’t to fret about trust, but rather to arm yourself with a framework for viewing how you choose to act such that people trust you. As with any new practice, noticing how your actions influence trust will become more natural with practice. Over time you may start to notice that you’re improving the relationships in your life and are a more effective coach. It may even help you grow your business. Trust and Growth. Paul J. Zak and Stephen Knack, Source: The Economic Journal, 2001, 111 (April), 295-321. Trust Dynamics: A Data-Driven Simulation Approach. Olufunmilola Onolaja, Rami Bahsoon, and Georgios Theodoropoulos. Source: The School of Computer Science, University of Birmingham, UK Procedia Computer Science, Volume 4, 2011, Pages 1751-1760. An Integrative Model of Organizational Trust. Roger C. Mayer, James H. Davis and F. David Schoorman. Source: The Academy of Management Review, Vol. 20, No. 3 (Jul., 1995), pp. 709-734.